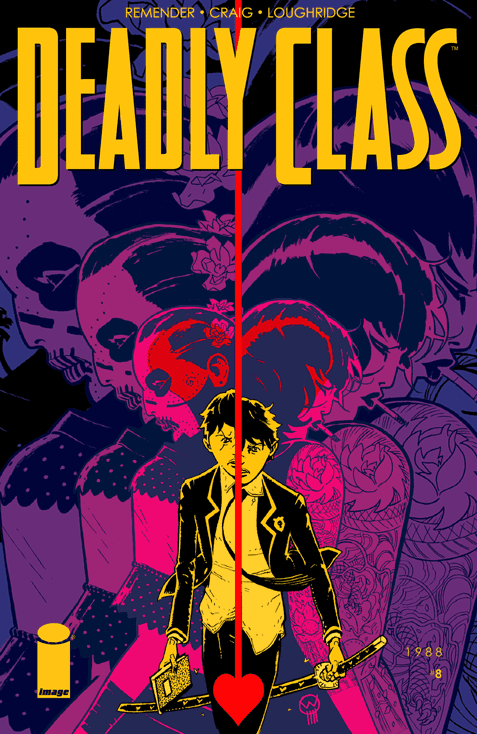 Matt C: Rick Remender puts out a lot of books that sit firmly near the top of my pull-list - Black Science, Uncanny Avengers, Low - but the one I've taken to heart the most is Deadly Class. Maybe because I was of a similar age to the cast back in the late '80s, or maybe because it captures teen tribalism with such acute honesty, or maybe because it's coming at the 'school for assassins' concept in a completely unpredictable angle, or just maybe it's all of the above. Whatever - it's really connected with me, and the combination of Remender's words and Wes Craig's art is more than enough to guarantee that Deadly Class #8 is my most anticipated title this coming Wednesday. Remender has another book out you may have heard of: Avengers & X-Men: AXIS. The first issue wasn't at all convincing but I'm willing to stick with it to be convinced based on all the good work the man has put in on Uncanny Avengers (the title the miniseries is spinning out of). I get the feeling the more enjoyable comic tied into AXIS will be Magneto #11 though and I could probably put money on New Avengers #25 being where the best action featuring Earth's Mightiest Heroes is, based on the outstanding preceding instalment. Also of note, because I got to it too late to review the first issue, is the War Of The Worlds/Wind Of The Willows hybrid, Wild's End #2, which is rather delightful book with a mean streak running through it. One to watch out for. Stewart R: Like Matt, I will be investing in the Rick Remender double-bill this week of Deadly Class #8 and Avengers & X-Men: AXIS #2, and like my esteemed colleague I feel that Deadly Class can pretty much do no wrong at present with its depiction of 1980s styled teen angst and lethal assassin antics. It's still not clear just where this series will be heading, but the ride alone has been gripping enough to suggest there's hopefully more excitement to come. Avengers & X-Men:AXIS #1 of course received a very mediocre review from yours truly and as the week has gone on I'm more convinced that the basis of the story is strong enough and should Adam Kubert manage to up his game and deliver a better sophomore effort then perhaps this will be an event that grows stronger as the chapters roll in. Thankfully, even if the art doesn't shape up this time, Leinil Yu is set for #3 so we'll get an opportunity to see if he can't bring his top quality work to the party. Elsewhere it's feeling like a quieter week, perhaps very loosely associated with the publishers all focusing on this past weekend's New York Comic Con - oh how I was wishing I was there this year!! - but there's still some titles of note. Winterworld #3 is out from IDW and I have to say that while the release schedule of this book feels glacial presently, Chuck Dixon and Butch Guice have been doing a fine job of portraying this snowy, desolate version of Earth. Then there's one of my firm favourites, delivering its *sniff* penultimate *wipes away tear* issue. Yes, of course I am referring to Nick Spencer and Steve Lieber's Superior Foes of Spider-Man #16 and for me this has been the standout comedy comic book of the past two years. It's shown that Marvel's vast canon of C and D list villains can be entertaining and provide a cast of engaging characters when handled correctly and Spencer and Lieber have handled Boomerang, Shocker, Speed Demon, Beetle and Overdrive with care and a huge dose of tongue-in-cheek laughs.